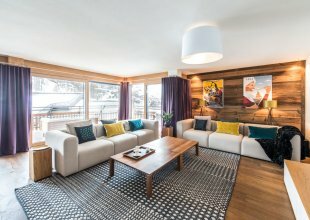 Situated close to the main street and the Sunnegga Express lift station, just a short walk into the centre of the resort. Zermatt Loft is one of the most luxurious chalets in Zermatt and is quite unique with an unmatched view over the roof tops dominated by the Matterhorn. There are five double bedrooms, four of which can be configured as twins. Every detail of The Lodge has been carefully thought through and meticulously finished, with wooden-beamed ceilings, aged wood floors and stylish yet cosy furniture giving a warm feeling of old-world charm with a crisp modern finish. For your wellness, The Lodge features a special outdoor Jacuzzi hot-tub with a view of the famous mountain, and has its own sauna/steam bath. 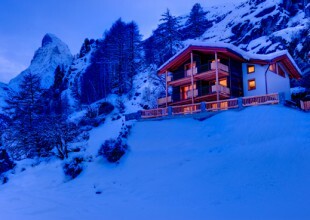 Price is based on exclusive use of the chalet to include full gourmet catering with open bar. No travel included. Five bedrooms of which four can be made up as doubles or twins and one is a fixed double. Each bedroom has its own LCD flat screen cable TV and DVD player, an en-suite bathroom with either a bath or a massage shower and a range of Elemis (the SPA specialists) toiletries. The master bedroom has a separate shower room, and a bathtub by its own fire stove. To meet our client's needs and desires we offer wide range of support services. Our concierge team will ensure that you get the most out of your holiday and will help you select a number of other services. These may include child care, health an beauty treatments, planning your heli-skiing adventures, designing and hosting corporate events, or simply booking your restaurants, ski lessons and transfer arrangements. Our catered chalets include a very high standard of dining and service including also our daily cleaning. Your pre-arrival chef consultation will ensure that you menu has been tailor made to your meet your preferences and expectations. Michelin trained head chef Kostas Papacharalampous heads up our team of chefs, who are carefully chosen not only for their superior skills and experience, but also for their friendly, flexible and approachable nature. Kostas has been a chef since 2004 when he started under Greece's star chef Christoforos Peskias, whose mentor is Ferran Adria of El Bulli fame. He then went on to train for a year under Joël Robuchon in Paris, and spent a further year in the culinary hot house of northern Spain working under Andoni Luis Anduriz in the 3 Michelin star Mugaritz restaurant, and then under Juan Mari Arzak who also has 3 stars. Kostas is the most passionate chef we have ever met and he has created a special menu for this winter season.